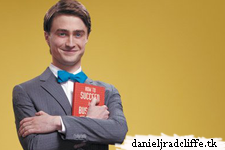 The cast recording of the hit Broadway revival of How to Succeed in Business Without Really Trying starring Daniel Radcliffe and John Larroquette will be released on iTunes on May 24 (see below!) and in available in stores on June 7. A recording session was held on April 11 at the Manhattan Center, produced by five-time Grammy nominee Robert Sher for the Decca Broadway label. Update: 24th May 2011. The recording will now be digitally released May 31, one week later than previously announced! The cast from How to Succeed (with Daniel Radcliffe ofcourse) : Rose Hemingway as Rosemary Pilkington, Tammy Blanchard as Hedy La Rue, Christopher J. Hanke as Bud Frump, Rob Bartlett as Twimble/Wally Womper, Mary Faber as Smitty, Ellen Harvey as Miss Jones, Michael Park as Bert Bratt and Anderson Cooper as the voice of the narrator, Cameron Adams, Cleve Asbury, Tanya Birl, Kevin Covert, Paige Faure, David Hull, Justin Keyes, Marty Lawson, Erica Mansfield, Barrett Martin, Nick Mayo, Sarah O'Gleby, Stephanie Rothenberg, Megan Sikora, Michaeljon Slinger, Joey Sorge, Matt Wall, Ryan Watkinson, Charlie Williams and Samantha Zack.